Muggsy and Dell made the Hive go “Ayye” in the early-to-mid ’90s. In the early days of the Charlotte Hornets, Steph and Seth’s dad and Muggsy Bouges were two of the more popular members of the team. 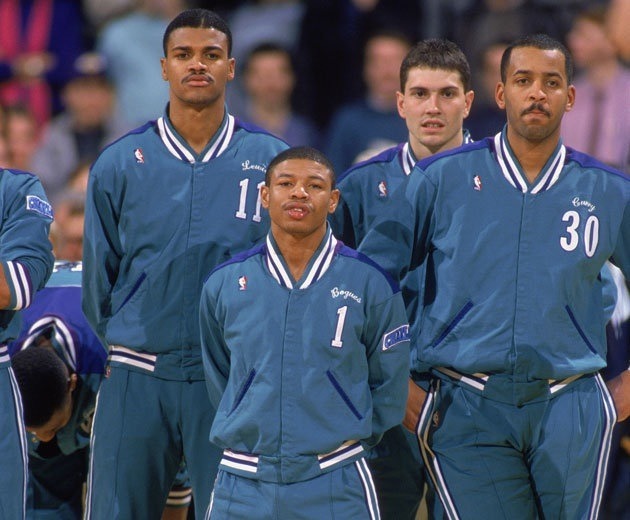 Before there was Grandmama and Zo, Muggsy and Dell were the face of the Hornets. They weren’t the most athletic bunch, but Mark Jackson and Reggie Miller were a tough out in the playoffs every year. 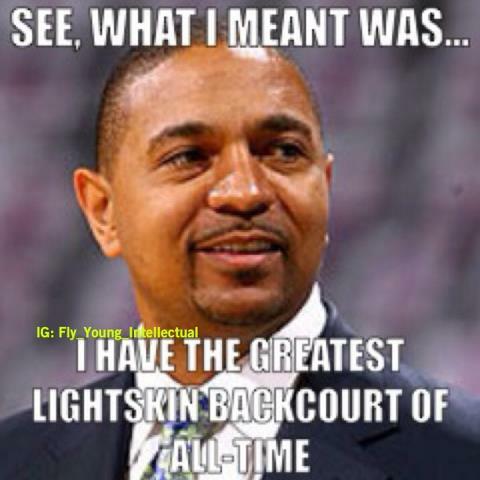 Mark Jackson knows a thing or two about great light-skinned backcourts, as he teamed up with Reggie Miller to lead one of the most heady, if athletically-challenged backcourts of the late ’90s. The inability to capitalize on the talent of Jason Kidd and Jimmy Jackson haunted the Dallas Mavericks until they won the ‘chip in 2011. Oh, and Jamal Mashburn was here for the pic too. The Dallas Mavericks were awful for the entire decade of the nineties, consequently giving them top ten draft picks pretty much every year. 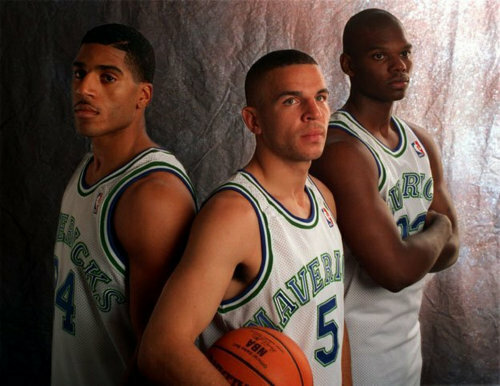 Kidd and Johnson were picked two years apart and teamed with Jamal Mashburn to form a trio that Dallas hoped would lead it to the promised land. Well, that didn’t exactly happen, and as a result, we have the most disappointing duo on this list. (See, we won’t even mention Toni Braxton….Ooops). Before Christie was Jackie’s husband, he teamed with Mike Bibby to form one of the brightest backcourts of all-time. This pair was an intregal part of those memorable Sacramento Kings squads that had the misfortune of peaking at the same time as Shaq and Kobe’s Los Angeles Lakers in the early 2000s. Alas, Christie will probably be better remembered for being the husband of Jackie Christie than his stellar career as a defensive specialist. 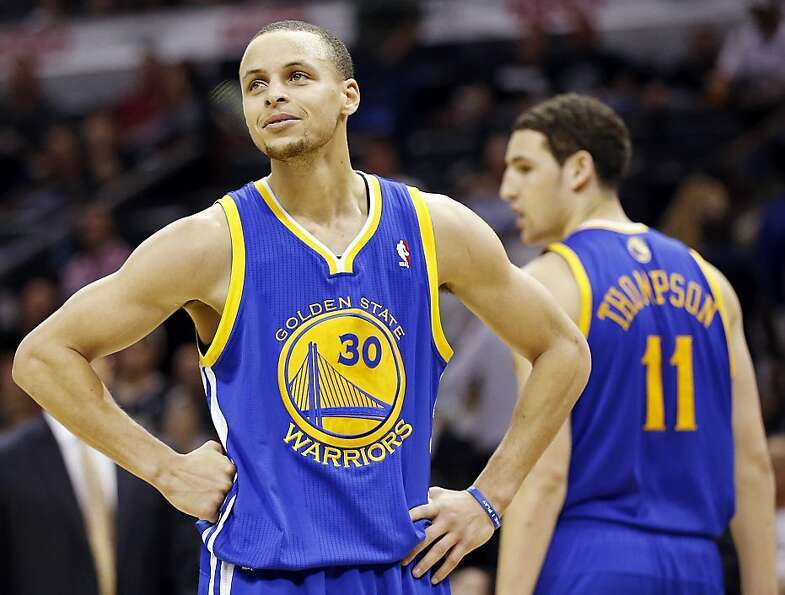 This backcourt’s future is as bright as their…well, you get the picture by now. The spawn of former NBA players, Curry (Dell) and Thompson (Mychal) have provided Golden State with the most excitement since its epic 2007 playoff run. The Miami Heat show support for Treyvon Martin in a rare political statement for professional athletes. Over the past week, no story in the country has been discussed, dissected and analyzed like the Trayvon Martin case. Dozens of rallies and vigils where held over the past week in memory of the 17 year-old who was gunned down by neighborhood watchman-turned-vigilante George Zimmerman. Other than a few crass comments from right-wingers like Geraldo Rivera and Sean Hannity, most folks have expressed their outrage over his death and support for the young man’s family. Thousands gathered in New York on Wednesday for a Million Hoodie March in honor of the Florida teen who was wearing a hoodie at the time of his death. The past few days millions have donned hooded sweatshirts in their Facebook Profile Photos and Twitter Avatars as a sign of support. Despite the national outcry over the case, the sports world and the athletes that inhabit it, went on with business as usual. Games were played. Interviews were conducted. Checks were cashed. And no one was surprised. Why? Because that’s just what athletes, especially African-Americans, are expected to do. Play the game, smile for the camera and keep your opinion to yourself. That’s been the status quo ever since Michael Jordan’s “Republicans buy sneakers too,” comment. In a world where silence is expected and speaking out is risky, those small statements said a lot. The fame and money of superstar athletes like James and Wade sometimes insulate them from the outside world. Most things that affect the average person like high gas prices or unemployment just don’t factor very much into their daily consciousness. Earlier this week, in column for What Black Men Want, I said that any Black man who looks at Martin’s face and ignores the cries of his blood is out of touch with reality. It’s good to know that, at least this time, the athletes are with us. Arizona Governor Jan Brewer confronts President Obama moments after he lands in a Phenoix airport. In a world where we are exposed to media on a near constant basis, the old saying “A picture is worth a thousand words” seems outdated and cliche. Between 24 hour news channels and the internet we are inundated with images so quickly that we rarely take the time to do more than glance at them and briefly attempt to digest them before the next one comes along. The image above, however, warrants some level of deeper observation and reflection about the true state of our union. Less than 24 hours after delivering his annual State of The Union Address, President Barack Obama landed in an Arizona airport where he was met by Governor Jan Brewer. The bad blood between the two got its’ start after the Governor called Obama’s demeanor during a meeting last year “condescending.” The President took issue with her opinion assessment which evidently compelled Brewer to confront the President. It is both alarming and appalling to think that the political climate of this country has deteriorated to the point where anyone, let alone another elected official, has the audacity to approach the President of the United States in this manner. This is the type of behavior one would expect from a cast member of Bad Girls Club or Mob Wives, not someone elected to political office. The sad thing about the whole ordeal is that this will likely up Gov. Brewer’s national profile among many conservatives. There will be those who see her hand hand inches from the President’s face and cheer her on for “taking the fight to Obama.” That’s what this election is about for them. Not taking the country in a positive direction, which the President is already accomplishing. Not settling the inequalities that allow Warren Buffet to pay a lower percentage of taxes than his secretary. That is the sole reason Gingrich’s prospects for becoming the Republican Nominee are looking better and better every day. The good thing is, the Republican’s hate for Obama is pushing the party further to the Right and making a second Obama term increasingly likely. When the Los Angeles Lakers open up the 2011-2012 season against the Chicago Bulls next weekend, there will be some lineup changes in the Player’s Wives’ section of the arena. Not only is Reality TV star Khloe Kardashian going to be gone, but so will Vanessa Bryant. 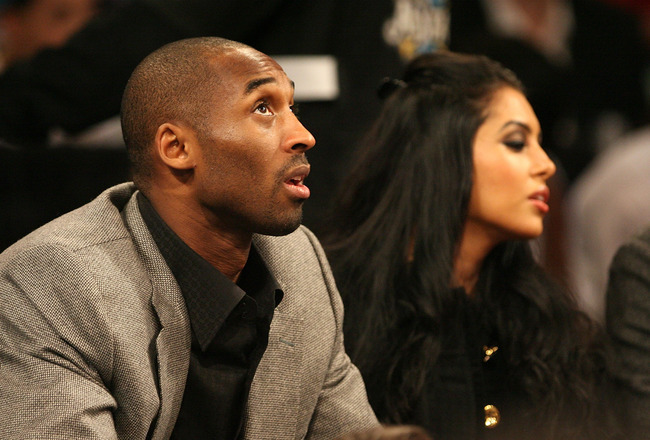 Yesterday news broke that the 29 year-old wife of superstar Kobe Bryant filed for divorce after 11 years of marriage. The two met on the scene of a music video back in 1999 and their short romance quickly turned serious as the pair was married shortly after her high school graduation the next year. The 21 year-old guard opted not to sign a prenuptial agreement. With the world and Bryant’s parents against them, the couple seemed to be doing just fine as Bryant pumped out babies and championships in the next four years. Then came 2003’s sexual assault allegations. Rumor had it that Vanessa was ready to split then, but then Kobe copped heavily jeweled ring worth a reported $4 million and all seemed to be well in Bryant land. But on December 16, Vanessa filed the papers for divorce, likely signaling the end of their marriage. With no prenupt, there’s no telling how much bread Kobe’s gonna have to break off to Vanessa. According to basketball-reference.com, Bryant has made almost two hundred million in NBA salary, in addition to the tens of millions he’s made with endorsements. I’m thinking Vanessa may get something close to the $96 million that Shaq’s ex-wife, Shaunie O’Neal got a few years back, give or take a few million. Bryant isn’t the first athlete to get caught with his pants down and no prenuptial, and he definitely won’t be the last. Every time I hear of some athlete getting divorced with or without a prenuptial, I have to ask– Why The Hell Did You Get Married? Think about it, you’re a young, muscular millionaire with women practically trying to rip the pants off of you at every turn. Unless you have A.C. Green-like willpower, why go before God and Man and promise to be faithful??? This is not to say that these athletes don’t love the women they marry, but we all know that some of the most rabid cheaters love their wives to death. When it ends badly, as most of them do, not only do you lose her, you also lose the kids and much of the money you worked so hard to accumulate. And let’s not forget your privacy! In this age of Twitter, Tell All Books and Reality TV shows, you can believe your business will be out on the street! On the flip side, if you’re a female being pursued by a professional athlete, are you really expecting him to stay faithful to you? Yes, he’s telling you that he loves you. He may even mean it. But the reality is that most men are only going to turn down so much of the good stuff. Especially a young, rich athlete who is constantly being stroked by everyone from his agent to his mother and feels he’s invincible, on or off the court. For all the talk about women loving harder than men, it seems like they also think of the business end of the marriage much more fervently than their husbands. Do you think it’s a coincidence that Vanessa chose to stay with a 25 year-old Kobe in his prime after her husband’s infidelity was highlighted in the media yet she is divorcing him at 33 and no confirmed reports of adultery? Maybe they just grew apart as sometimes happens. Then again, maybe she knew Bryant had at least six or seven peak years and two major contracts left? She stands to gain much more financially now than she did eight years ago. I’m just saying…. Moral of the story-love and money don’t mix, at least not for a professional athlete. If you don’t believe me, ask Eddie Murphy. Be honest with yourself, protect yourself and by all means, don’t get married until you retire!!! 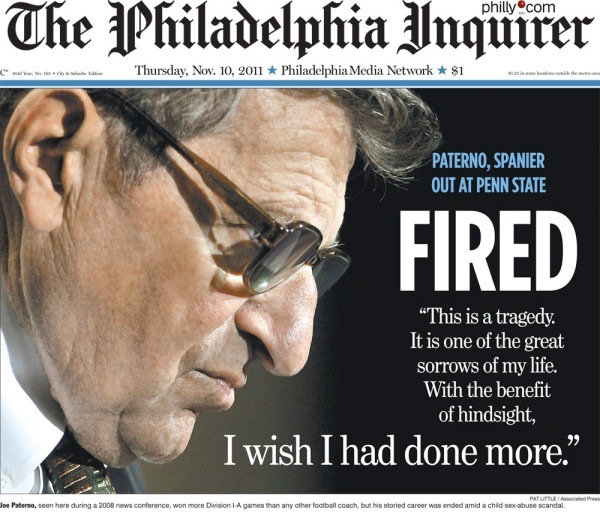 The front page of the Thursday's Philadelphia Inquirer, illustrating Joe Paterno's fall from grace. As I have watched the events of the 18 hours play out in State College, I keep telling myself the same thing: It didn’t have to end like this. Joe Paterno should have stepped down as head coach a long time ago. If he had, the ugly events that transpired on Wednesday night would never have happened. The 84 year-old, the man with the most wins in college football history, was effectively fired by the Penn State Board of Trustees on Wednesday night. In the ensuing hours, hoards of students took to the streets to show their support for Paterno, whose 46 year tenure as head coach came to an end as part of the fall out from revelations that Paterno knew his former defensive coordinator Jerry Sandusky had been accused of sexually abusing children. What started out as a peaceful gathering quickly turned ugly, with a media van being overturned and rocks and bottles being thrown at police. It’s obvious that Paterno, by his own admittance, could’ve done more to ensure that Sandusky was brought to justice. There’s no debating that. Around the sports world, there is a debate going on as to whether or not he should have been fired immediately or if he should have been allowed to finish the season. The truth is, if Paterno had done the right thing and retired a long time ago, this debate wouldn’t even be necessary. For much of the last decade, there has been speculation amongst college football prognosticators as to when the coaching career of Joesph Vincent Paterno would come to an end. Year after year, people questioned how a man born before the Great Depression could maintain the reigns of a major college football team in the 21st Century. Yet every fall Paterno continued to march out to Beaver Stadium with his team, basically telling those who thought he should step down that he would leave on his terms. It’s kind of like your grandad going jogging everyday and giving you hell for telling him he should stay inside. There’s no question that Paterno’s love for football and Penn State are what helped him ascend t0 the pinnacle of college football. They also made it tough from him to step down when he should have. Had Paterno been retired news of this scandal broke, the damage done to his legacy would have been softened tremendously. Paterno’s career should have ended with him being carried off the field by both his current and former players. He deserved better. Penn State deserved better. College football deserved better. Unfortunately, Paterno only has himself to blame for the way that it ended.